A gubernatorial contender in the Peoples Democratic Party (PDP) in Osun state, Hon. 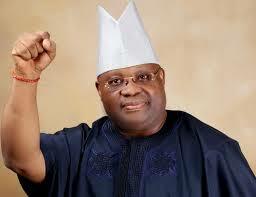 Albert Adeogun, on Friday stepped down his ambition for Senator Ademola Adeleke, ahead of the party’s primaries. Addressing a press conference after a consultative meeting held inside the residence of a PDP chieftain, Chief Abiola Morakinyo, Adeogun said his decision to drop his gubernatorial ambition, was as a result of wide consultation with stakeholders and the need to record electoral victory for the opposition during the election. According to the lawmaker, who represents Ife Central/East/North/South Federal Constituency in the House of Representatives, the collective interest and welfare of the people in the state compelled him to step down for Adeleke. “You have listened to my leader, Chief Abiola Morakinyo and he has clarified these issues. “He has mentioned the position of the party through their body language that this position is likely to go to Osun West and I am from Osun East. “I do mention that Osun State is made up of three constituents. Igbomina and Oyo, Ife and Ijesa. As we speak today, Igbomina and Oyo had their terms through Akande and Oyinlola. “Similarly Ijesa, through Aregbesola is occupying the seat. It is only Ife that is left out, but there are other arguments and these other arguments become unsustainable and it’s quite reasonable therefore to be realistic as a politician who has the best interest of Osun State. “And, coming down to work with Adeleke is borne out of our concerns for the state,” Adeogun said. The Osun governorship election is scheduled to hold September 22.